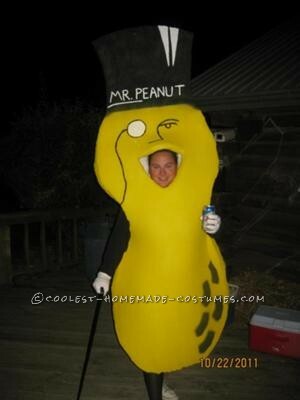 Luckily, my brother in law snagged some FREE foam from AM Foam in KC to make this Mr. Peanut costume. Firstly, I decided where my face would go (for the mouth/opening) on the foam to make sure I had enough room top and bottom, and enough foam. So I actually outlined my body with a sharpie on the inside of the foam. This way, I could also justify where I wanted the costume to sit on my shoulders, where I needed arm holes, and how wide the bottom opening should be all in comparison to the outer design. After I traced myself, I hand drew the Mr. Peanut outline (again on the inside of the foam). Once I was pleased with it, I cut it out with scissors, razors and sharp knives. I also cut the mouth out at this time. Then I placed the cut out foam on another piece of foam, traced it and cut it out for matching pieces. So, once I lined up the pieces to be mirror images, I started gluing. I was always afraid that the top piece would fall over, so I glued some paint stirring sticks in the hat area between the foam pieces. Then I sprayed the inside of the foam approx 2-3” wide all around the entire outline, except, where my arms and legs would go through. As I was gluing, I would stick toothpicks in the foam to hold the pieces together as well. The glue I used was: 3M “Super 77 Spray Adhesive”. Once the glue was set, I took it outside and spray painted it black and yellow for body and hat. I hand painted the nose, eye, string and monocle with a brush and some acrylic paint. The bottom accents were also spray painted, I created a cardboard stencil for it. Since I was going to a dance party, I didn’t want the costume to bust at the seams, so I actually went through and loosely sewed the foams together with thread. The costume was perfect and no ripping or tearing was caused. The only bad thing about it was getting in and out of it—you will need a bathroom buddy and someone to get your beer since it will be taller then your ceiling. The hat ended up staying erect since having your body between the foam pieces forced it to puff out a little making it stay straight up. Black long sleeve shirt, black leggings or pants, white converse, white gloves and a black cane complete it. My plan was to keep this and rent it out, but one my dogs found it and completely d e s t r o y e d it.